British Open 2017 – The Lithuanians are coming! 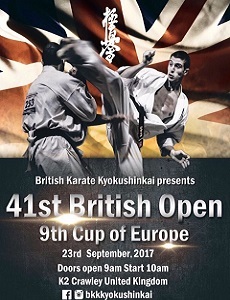 September 9th was the deadline for entries in the British Open 2017, and almost 100 fighters are ready for this years edition. One could early see that the entries was changing the usually picture regarding to which organization and countries that was coming. The list of profiled fighters is a little more modest than last year, but there is no doubt about that several high class fighters are ready. British Open 2017, 23rd September. British Open, heavily promoted and the flagship of IFK as a legendary Knock Down tournament. In 2016, last year, the British Open celebrated their 40 years anniversary, with impressing 39 editions of the tournament. (Not held in 2005 or 2007) The 40 years anniversary seems also to be a turning point for the tournament, where new nations from East Europe made a strong impact. Great Britain – Russia – ? Historical seen, British Open has been a tournament where the counties mainly of North/West Europe in the lead by Great Britain – naturally has been leading on. In the start/mid of the nineties (93/94) began Russia to make their “ownership” of the British Open, a the IFK was founded Autumn -92, with Russia as one of the counties coming in to the new organization. And from that and up to now, Great Britain and Russia has been the leading nations. Russia more or less doing what they want in relation of taking the titles home. After a down period, with none or few participants from Russia in 08 and 09, the level of the podium was at a another level, adding “The Cup Of Europe” brought the interest back again as more than one time this was referred to as the European Cup or European Championship. And since that point the British Open has been totally dominated by Russia. And not with one or two fighters, but to have two three fighters among the top three in several categories. This dominance of pro or semi pro fighters has made other nations and fighters think two times to join in. A change towards the East..
2016 the level was once again raised to a higher level. Contingents of fighters from other organizations entered the tournament, and from being a West/North European tournament, this as many others are going in the direction of a more Central/ Eastern Europe dominant tournament. Other organisations that have far more fighters, and a bigger base of/in Eastern Europe (countries) than IFK are coming in with huge impact. This is also why it would be so visible, British Open is a tournament that have up to now been little or non influenced by the strongest countries in Europe. 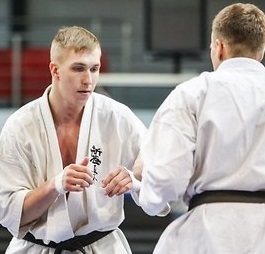 During 40 years of Kyokushin championships, only a handful fighters has been seen on the podium from countries as Poland, Hungary, Bulgaria, Romania, Lithuania etc. As we all know, the level of this countries in total are with out a doubt top class. 2016 was also supported by Kazakhstan. Looking at the results in 2016 gives us a picture that Eastern Europe are coming. This years edition of British Open is a step further i the direction East. One of the strongest nation i Europe, Lithuania WKO brings in almost 30 fighters alone. The number of fighters alone is impressive, and the Lithuanian team is a mix of up and coming fighters and some more established. Men and women heavyweight would be the categories that they have the strongest fighters, and the highest number of fighters. Then middleweight with a good mix. Men and women lightweight division would be the categories that fewer profiled fighters and fewer fighters from the team. Lithuanian top fighters proved their level in the KWU EC 2016, being on the podium ten of fourteen categories and dominating the women categories. Pushing KWU world champions down from the top spots. Coming into the tournament like this shows an agenda… and of course its will be a factor for others that will have to mobilize strong to battle about the top spots. To compare it with last year, are we looking at a little smaller tournament. Almost 100 fighters are in their respective categories, from different countries and organisations. The support from other organisations are overwhelming, and with out this the British Open had been reduced down to about IFK 35 fighters. these numbers point out how important it is to work across organisations. Winiarska made it to the top earlier this year in the IFK World Championship, and did also win the KWU EC in 2016! Sweden,also in with to fighters: Sanne Larsson and Sara Hägge ⇒ – last one reign EC Champion, and been runner up in the British Open from before. Aneta Meskauskiene, Lithuanina fighter but now fighting for Ireland IFK, did win the British Open in 2015, but we assume harder path to the top this time. And of course the “draw” will also matter. On top of this the Lithuanian team have more fighters that will be a factor in the tournament, “the Gustaityte`s” Magdelena and Brigita would be an good example of this. 15 fighters in this category, and the level are very wide. There is a huge gap between the top fighters and the fighters with little experience. The level are not at the same high as in the heavyweight category, but do have some good profiles. ⇐Anna Efremova (Russia), Diana Maciute (Lithuania) Emma Markwell (GB) always strong, hard to beat at home soil. Lillia Herczeg (Hungary) would be naturally to count in, looking at the podium. Spain with Teona Gazdeliani, high pace aggressive fighting, but could easily loose on warnings due to her (to) high punching. Lithuania do have more fighters in the category, but less profiled. Many was waiting for the big names as Inga Mikštaitė and Rita Pivoriūnaitė, both clean the tables in KWU EC – but one can assume that they will be ready for the KWU World Championship in December. Last year this category was one of the most interesting in the British Open. This year seems to follow that nicely up. Many of the favorites are winners from before, or runners up. Spencer Bennett (Wales) (2012) and Daniel Redondo⇒ (Spain) (2011) winners, both at the podium several times. Daniel Redondo the runner up in 2014, loosing the final in a very questionable decision. Recently climbed to 3rd place in the IFK World Championship 2017. 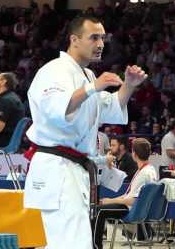 Wesley Jansen (Ned) 3rd place in 2011/12) 3rd in the KWF EC 2016. Always interesting to watch with his supreme kicking skills and high-pace fights. Maxim Voitov (Russia) 3rd place last year, and his team mate ⇐Anton Adushkevich, coming 2nd in 2015 after being robbed in the final, being clearly the strongest and even sending his opponent down with high kick – only 2nd. Russian team strongly represented here. Lithuania are not represented in this category at the same way they are in the rest of the tournament, “only” two fighters, with Jevgenij Jurut as the one with some merits. 3rd place in the KWU EC. Its fair to expect that this division would be with some “Russian spice” but as mention, several strong fighters are in the line up. This category with (now) 27 fighters is the largest in this years British, and as we mention regarding to the women`s lightweight, the level are represented very wide and for sure there will be some fast finishes. The middleweight has been Russia all over.It has been common to see 2 and 3 Russian fighters at the podium, this time they are not represented in this category at all. The Lithuanian team have not less than seven fighters in the category. A mix between up and coming and established athletes. Vytautas Cėpla ⇒ and Justinas Kvietka will be those with more experience, and out of those two we would pick Cėpla as the one who reaches the furthest. the category do also have a really nice mix with fighters from different countries. Sweden have a really strong competitor in ⇐Jonas Rosin. The Swede have been at the podium many times in different accessions. Won the 4th World Cup Rengokai in 2015, 3rd place at the World Championship KWU 2015, also runner up in the KWU European Championship 2016, and recently 2nd at the 6th World Championship 2017. Rosin will without a doubt challenge the top spots, and to defeat him will cost a huge effort. Hungary have a couple of profiles in the line up as well. Zsolt Zsiga has been a regular participant in the tournament, and was the runner up in 2012. Since then he has not manage to reach the podium in British Open. That said Zsolt Zsiga has been active and fighting across several organizations with good results. Last year he fought in the heaviest category, but now he are back in the middleweight. Changing weight category will also be a fact for top Hungarian fighter ⇐Gábor Rózsa. A technical athlete beyond the ordinary. Stands for technical purity in his stylish fighting, which has given him five European championships. 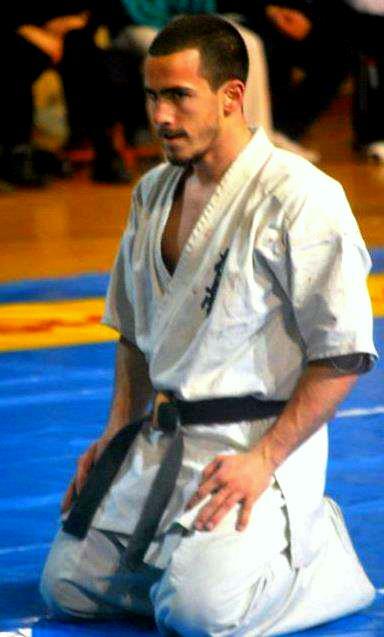 Also has won the All Kyokushin World Tournament in 2009 / IFKK. Technical, explosive and ability to finish matches with quick knock out. From 2007 and up to 2013 he won the European Championship WKO five times and several other titles. 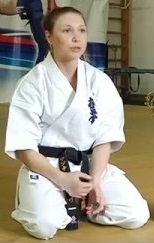 But this was also in the lightweight category under 70 kg. Now up against bigger fighters it will be bigger challenges. The question in recent years has been which of the Russian athletes who won the British Open, and not if they won. This was the case for many years, until 2016, where there was a change. Once again, from totally dominance to almost totally absent. 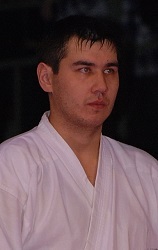 But one Russian fighter are ready, winner of British Open in 2015 Aleksandr Karshigeev. This year he has all ready made a good impression, in May 3rd place in the IFK World Championship, and now just recently the runner up in the Russian KWU World Championship qualifying tournament in the +95 kg category. Lithuania bring in six fighters, also here there is a good mix between well known fighters and new names in a bigger setting. The top three of the six would be Eventas Gužauskas, Edgard Sečinski ⇒and Kestutis Radvila. All three with good results in several tournaments. But in total we would say that Gužauskas and Sečinski are even a little ahead of that again. Both with WKO EC podium results several times, Gužauskas EC Open Weight winner Sečinski with a strong 7th place in the World Championship WKO 2015. Sweden do also have some muscles in the tournament, Mattias Lindgren and Simon Pålsson. Last one well known for the most of us. Had a good spring through EC WKO, manage to qualify in to the 6th World Championship weight categories. France are also in the tournament, and have several fighters spread around in the categories. In this category,+80 kg, Jean-Paul Jacquot will represent France. Jacquot being the reign KWU European Champion (held in 2016) 5th place in the IFK World Championship 2017. It is safe to say that British Open has changed significantly in recent years. More semi or pro fighters are coming in to the tournament, and the level between top and bottom has never been bigger. Athletes that trains more “in a day” than others do in a week is a fact. The draw, or the seeding will also bring this into the real. It seems like the mid level are gone, or is less apparent. The professionalism has come greatly with the increase of the Eastern bloc in the tournament. But this is not a “British Open phenomenon”, for this is something we have seen coming, and you see it all over. 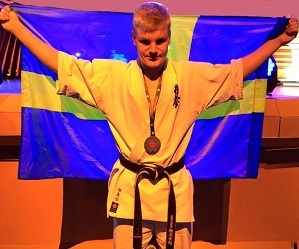 The IFK World Championship an the KWU tournaments are good examples. That said, British Open 2017 will be as it always has been, a long day with full contact Karate fighting. Winners will be announced, and fighters get their rightful honors. Only a few days left..wait for it!